Arm balances can seem really impressive and intimidating and impossible. But I would encourage you to give this pose a try! Crow pose was the first arm balance I learned as a yogi, and I think like me, you will surprise yourself with your own strength. You won't know what you're capable of unless you try. Even if you're not ready for an unsupported variation, one of these modification ideas can give you the same benefits! I would recommend warming up before you practice this pose. Some hip opening poses like Pigeon Pose and Garland Pose would be great choices. If you're practicing any of the variations that place weight on the hands, I would also recommend doing this practice to warm up your hands/wrists. Start by coming into a squat on your tip toes with the big toes touching. Take the knees wide. Place the hands flat on the floor, about shoulder width apart. Fan your fingers and press firmly into all ten fingers. The fleshy part of the hand between the index finger and thumb should also be pressing into the mat. The center of the palm is lifted. This focus on hand positioning will help to protect your wrists. Snuggle the knees as close as you can get them into your armpits. The knees will be resting on the backs of your arms. Lift the hips up in the air and lean forward so that your weight shifts onto your hands. Engage your core. Pull the belly button in toward your spine. You will feel the back body round, and this is good. This is what is going to give you the lift you need. When you're ready, lift one foot off the floor. See how that feels. Then lift the other foot. The big toes should be touching. This pose does require arm strength, but it also requires core strength and hip strength to hold the shape. I have seen people on Instagram doing crow pose challenges where they're timing how long they can hold it. But honestly, if you can only hold this pose for a couple seconds, that's great! I can only hold it for a few seconds myself. Because of this, I usually will do repetitions. So I'll rest for a couple breaths in between each attempt. This allows me to build strength at my own pace. Honor your body. Whatever you are capable of doing is worth doing. Adding blocks will allow you to put more weight on your hands and create the shape of crow pose without actually lifting your feet. So this is going to help you feel more stable while still building strength. You can practice holding this variation for up to one minutes or you can practice doing repetitions of shorter holds. 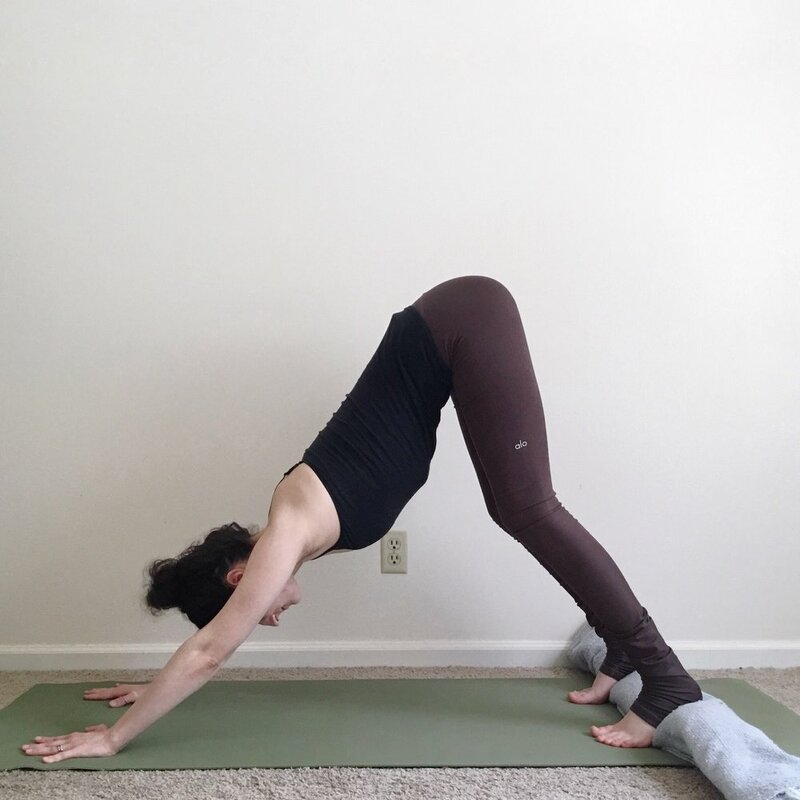 This variation is similar to Navasana (Boat Pose). To practice it, sit down on top of a yoga block. Extend your arms in front of you with the hands flexed. Engage the core muscles and pull the knees up toward the armpits. You can keep the toes resting on the floor, or if you'd like more challenge, you can lift the feet off the floor. Hold for up to one minute, or practice doing repetitions or shorter holds. For this variation, you will sit at the center of your chair so that when you lean into crow pose, you don't tip forward and fall on your face. In your seated position, take the knees wide. Then lean forward so that the knees are snuggling up toward the armpits. The hands are going to come onto blocks, about shoulder-width apart, adjusting the height of the blocks as needed. Press into the palms of the hands. Engage the core muscles and round through your back body. Bring the big toes together and lift the feet. Don't be fooled! This pose is challenging, even when done in a chair! Practice holding this pose for up to one minute, or practice doing repetitions. This variation is my current favorite! In this variation you get to really focus on your hips and core. You're strengthening your core and teaching your body what it feels like to make the shape without worrying about falling. If you've never done crow pose before, I'd recommend starting here. To practice this variation, lie on your back. Extend the arms straight up toward the ceiling like you're trying to push the ceiling away with your palms. Then engage your core muscles and bend your knees up toward your armpits. Lift your head. Get round in your spine. Feel the belly button pull in toward your spine. Hold the pose for 5-10 deep breaths or longer, depending on your comfort.